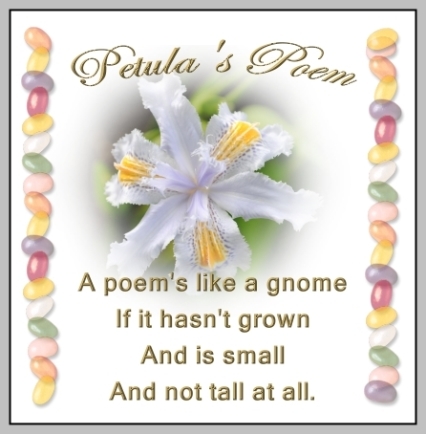 Petula wrote poems for a magazine. In fact, she had her own monthly column, called Petula’s Poem. Murray was in a hurry. Murray was called Muzz, which was a buzz. He cut himself while shaving off his facial fuzz. Oh! lo! What a busy buzzy bee he wuzz! Sybil: What is a reputable magazine such as yours doing publishing such nonsense? Angelique: What garbage! The word “drivel” comes to mind. Chantelle: The editor should be sacked. If she was younger, Petula would hopefully be put over someone’s knee and spanked for writing such childish balderdash. Maureen: I would cancel my subscription if it wasn’t for July’s excellent article on listening to Mozart during pregnancy: A Classical Gestation. Enid: Petula should be sent back to school and taught to write. Her poem doesn’t even rhyme accurately. Let alone scan. There are rules when it comes to writing great poetry that she should learn. She could begin by studying Helen Steiner Rice. Over the next few months the controversy raged. Very few readers supported Petula. Yet the editor still published Petula’s Poem. To which Avis wrote: Being able to rhyme and die does not as such make for great poetry. I say good riddance to Petula’s silly verses. The editor should be hanged, drawn and quartered for inflicting upon the world such unadulterated, crapulous verbage. Many subscribers secretly agreed with Avis. The Kindergarten Kronicle passed into oblivion in March.